Another Champagne Problem… – Eat, Drink, and Go! Champagne problem, as defined by example: When you need a little wine to cook with and have nothing but a great bottle open and no shwag (sp?) on hand, that’s a champagne problem. Used in a sentence: When your problems are champagne problems, you should feel blessed. And I do. 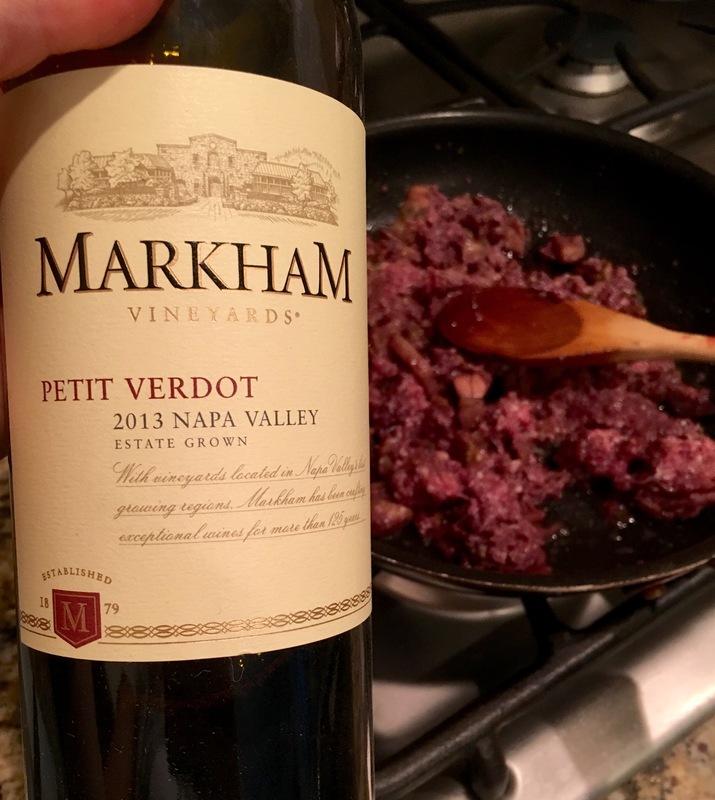 Anyhoo, I needed just a bit of red for a sautée and the only thing open was a delicious Petit Verdot by Markham. I cannot, however, consider it a waste of the vino because the dish came out incredibly good and needed very little seasoning. The richness of the wine deeply penetrated the sautée of lamb and eggplant. It gave the dish that “umami” and the “je ne sais quoi” that’s hard to achieve in home cooking. And hard to find the right words for in the English language such that we have to borrow from the Japanese and French to capture it. I’m sorry I didn’t do a full pictorial and write up of the whole dish here, but I felt it was pretty similar to a stuffed eggplant I did recently. Yet it was noteworthy regard to the wine problem – only having a good one on hand. And then you have a no-brainer pairing to drink with the meal! If you haven’t tried a good (or any) Petit Verdot red varietal yet, you should. I find it to fall between a Pinot Noir and a Cabernet Sauvignon in boldness, but if you know wine, you know that every vintner’s goodies are different. Be generous and fair, try lots! The Clos du Val 2012 (I wrote about it recently) will knock your socks off. Which is good because if you drink the whole bottle, getting them off yourself will be difficult. This Markham bottle was also very good. I suppose I’ve truly taken to heart the advice I got once about cooking with wine – don’t cook with a wine you wouldn’t drink!